Simple, yet elegant enough to wow co-workers or the in-laws and doesn’t take more than an hour! Looking to show off your crochet talent at the next holiday or event? This is the pattern for you. There are very few patterns that work well with variegated yarns and everyone is always asking for ways to use it. This pattern is one of those patterns. 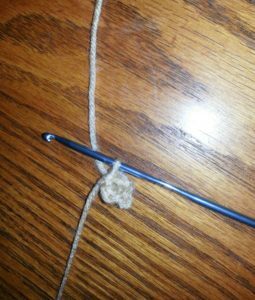 Photo tutorial on the beading of the tie ends. If you do nothing else, go take a look at the pattern purchase link below and look through the tester photos. They worked hard for this pattern! The cuteness here is unparalleled! I have been getting requests from testers of mine and those following my newly released patterns, to include a tutorial on the magic circle. I know there are other ways to do this, but this is the way that works for me. 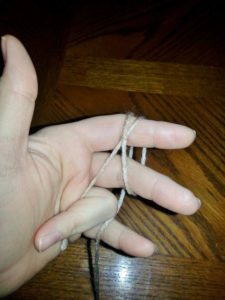 For me, after all the searching I did when I first started, this was the most simple to maneuver in my hands and the steps are easy to memorize. The only difficult part is figuring out where everything goes and HOW to maneuver it. Once you figure that out it will come easily to you. 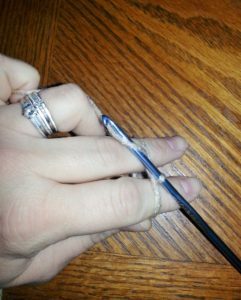 I am right handed, so this is a right handed tutorial. 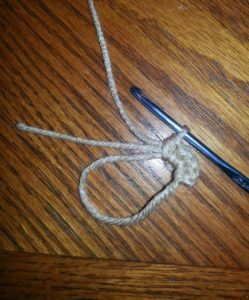 I am performing single crochets, but I give instructions for the half double and the double crochet as well. A hint: This takes practice. It takes the human mind 6 times to repeat something before it can retain it effectively on average. 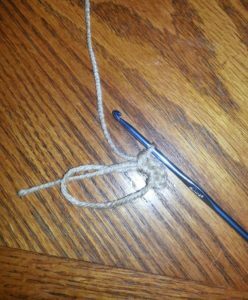 🙂 It would help if you just swung the yarn around your hand a few times and just practiced the steps over and over before you really started. I think I spent a few hours just wrapping, crocheting, unraveling and starting again. The Magic circle is a technique used when starting to work something in the round. Hats or any shape that lays flat even, but are crocheted in the round are started in this way. See Working in the Round for more information on other methods for starting your round. 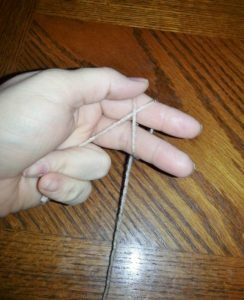 Start by holding the yarn in your left hand like this. 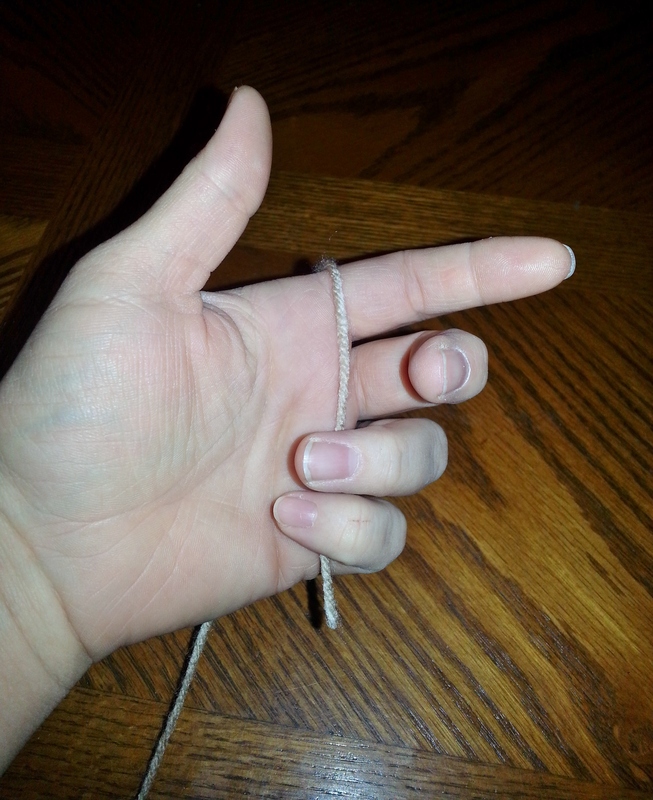 Here is that same hold shown more loosely so you can see exactly how it’s wrapped and how I hold it. 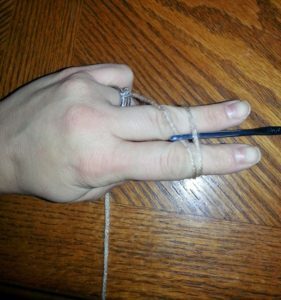 Hold the working yarn between your pinky and ring finger to keep it tight. This is what it looks like from the top when you grasp it a little more tightly. 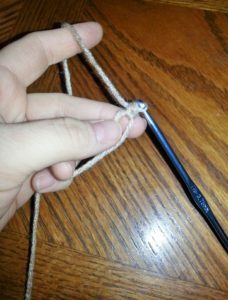 This is the tension I use to complete this technique. Tension is the trick to this. 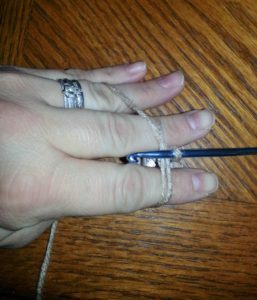 Remember to always hold between the pinky and the ring finger back there to ensure proper tension. And now we begin. From the top of your hand, insert your hook under the first loop around your fingers, and grasp the second loop. 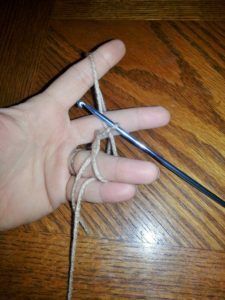 Grasping the loop you just pulled through, turn your hook down and then facing you and up so that you now have a new loop on your hook.You’re essentially just twisting it so it holds taught enough you can do something that will hold it into place. If you let it go now it will fall apart. 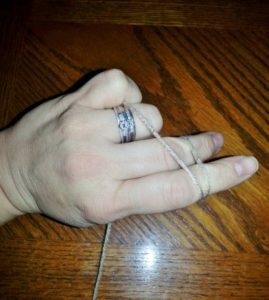 This picture I took to show you how tightly I hold the yarn when I am actually performing the magic circle technique. It really needs to be this tight to work. 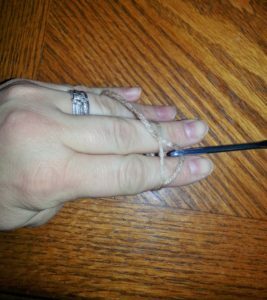 Remember to always hold between the pinky and the ring finger back there to ensure proper tension. 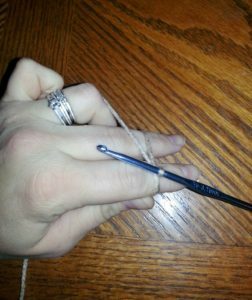 Now, yarn over around the working yarn that you’re holding between your pinky and ring finger…. … and pull through to complete your first chain. This does not count as a first stitch. 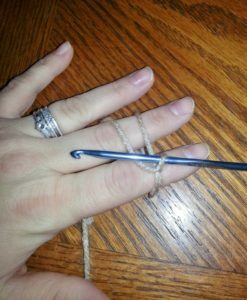 This is only to secure the circle so that you don’t have to hold so tightly and can begin your stitches. 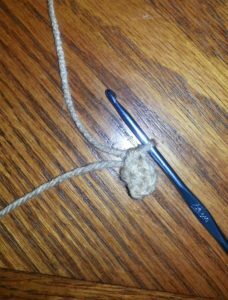 Here is my first single crochet completed around the magic circle loop. And here are my 5 single crochets around my magic circle loop. Notice that the tail is going to be inside. I pull it out before I start. Pull the tail and it will tighten. So that is the way that I perform a magic circle. If you have any questions, feel free to comment below or message me @ The Articles of a Domestic Goddess Facebook Page and I would be happy to help you in any way that I can. Happy hooking!